Webbox Dry cat food is a range of complete diets for adult cats. They contain all the necessary nutrients to ensure your cat receives a healthy diet every time. Cats Delight contains 25% real fish or meat to create a highly palatable meal, along with natural antioxidants, a prebiotic to support healthy digestion, cranberry extract to aid with urinary tract health and marigold extract which supports the immune system. 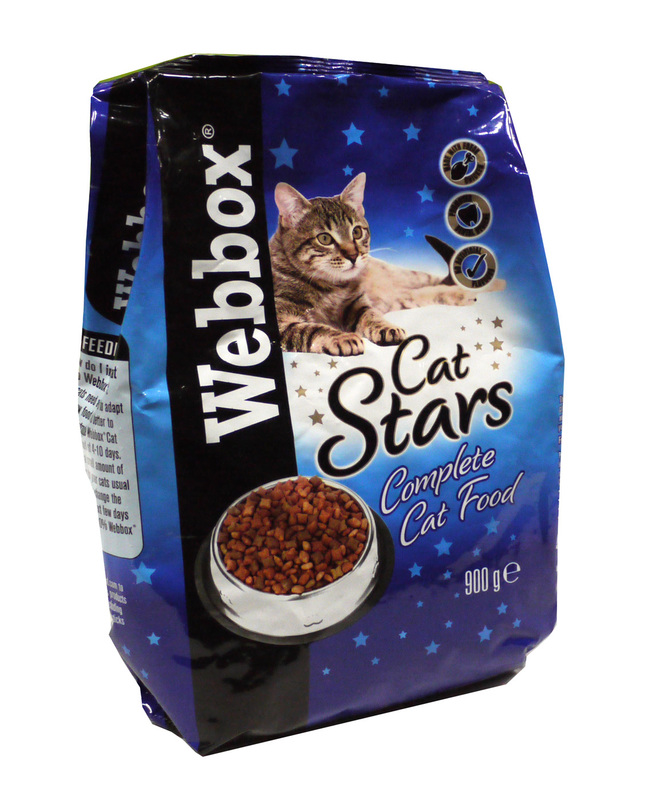 Webbox Cat Stars has been specially formulated to include the right balance of protein, fat, nutrients and carbohydrates. This delicious meal can be fed daily to provide a fully balanced diet which promotes an active lifestyle. Meat and animal derivatives (4% fresh chicken), cereals, derivatives of vegetable origin, vegetable protein extract, oils and fats, various sugars, minerals, yeast. Vitamin A 42000iu, Vitamin D3 1680iu, Vitamin E 125mg; Trace Elements: Ferrous sulphate monohydrate 101mg, Copper sulphate pentahydrate 14mg, Manganese sulphate monohydrate 55mg, Zinc sulphate 69.9mg, Calcium iodate 0.908mg, Sodium selenate 0.27mg, Taurine 0.29mg. There are currently no questions for Webbox Dry Cat Food - be the first to ask one!